Pain management can feel like a puzzle, and, relief is not one-size-fits all. That’s why LauraBeth Garcia, Physician’s Assistant with Advanced Pain Management & Rehab, wants to spread the word about what options are available, so patients don’t spend countless hours looking for answers. Advanced Pain Management and Rehab is offering that service through a free lecture series that’s open to the public. 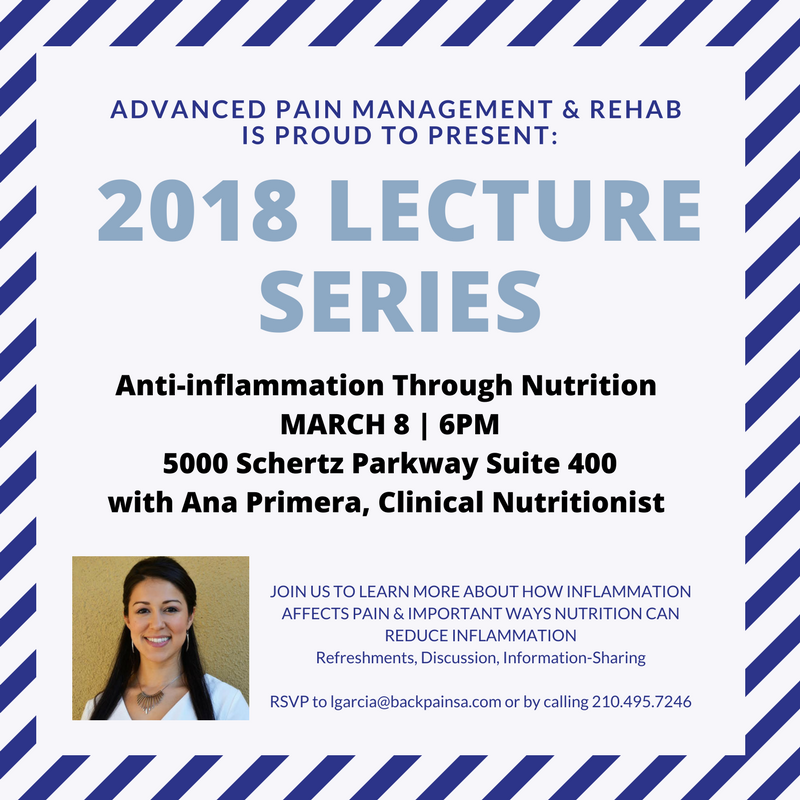 The March 8 lecture will focus on how nutrition contributes to how we feel and how we manage pain. Ana Primera with Primera Wellness will help shed light on how food and pain work hand-in-hand. “People with chronic pain might not know there are natural spices like ginger, turmeric and cinnamon that can decrease overall inflammation and on the other side people do not know that foods cause inflammation like nightshade foods, processed foods and others. Ana will even share recipes with those at the lecture,” Garcia said. Garcia first started dreaming of a lecture series last October while attending the Texas Pain Society Conference. She was inspired by the multimodal approach that is incorporated at Brooke Army Medical Center’s functional rehabilitation program. Active and retired personnel of the military go through an intense program of physical therapy, yoga, aquatic therapy, meditation, nutrition and other methods to help control pain without medications and interventional procedures. Garcia wanted to offer those choices to civilians in hopes they would incorporate this along with interventional pain management. Dr. Stephen Dinger, D.O., and Founder of Advanced Pain Management and Rehab, was immediately on-board with the idea. APMR’s Free Lecture Series will go beyond nutrition. Future lectures will feature experts in Physical Therapy, Yoga, Meditation, Chiropractics, Acupuncture and Tai Chi, among others. Dates and additional information are posted on Advanced Pain Management’s Facebook page and website. Garcia and Dr. Dinger welcome all to the free lecture series and look forward to seeing you at their Schertz location, soon.